HARRIS — Part of a Symetra Tour player’s responsibility is joining men and women from the area of the tournaments in a pro-am round of golf. The Island Resort Championship at Sweetgrass Golf Club in Harris stages a pair of these events each year. A pro joins four amateurs in a scramble event each Wednesday and Thursday, with the pros treating it as a practice round with light competition. The pros are placed depending on their money list ranking or if a sponsor requests a certain pro. “I use it to practice a little bit, but mostly to entertain the people you are playing with,” said two-year Symetra veteran Brittany Marchand of Orangeville, Ontario, Canada, after Wednesday’s round. Her group finished at 4-under-par 68, most of those strokes supplied by her unerring shots. She will offer advice, but only if the amateur teammate asks for help. “I’m glad to give what advice I can, but it is really hard to interpret because there are enough different swings and you could make it harder for the amateur,” she said about perhaps giving conflicting advice from what they may have received from their local pro. Marchand chats with her amateur partners throughout the round, while concentrating on her shot when it is her turn. “I try to stay quiet and I try to make it light,” she said, indicating each amateur is different, which can create numerous challenges at various outings, such as an amateur who may hammer drives 300 yards, putting her in different fairway spots from her normal drive. Marchand, who began playing golf at age 7 after spending her earlier years as a figure skater, played at North Carolina State University, where she posted three victories. She played in the 2011 U.S. Women’s Open at Broadmoor in Colorado Springs, and won the Ontario Women’s Amateur championship in 2012. 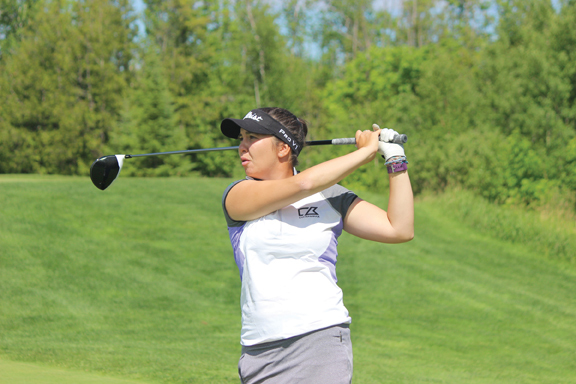 She played in the LPGA Tour’s Manulife Classic two weeks ago in Cambridge, Ontario, and finished 45th after being in the top 10 entering the final round. She shot a 67 while paired with the tour’s No. 1 player and tourney champion, Ariya Jutanugarn. She made 19 of 21 cuts in her rookie season and this year is only 50th on the money list in nine events with $7,510.